The festival of Navratri (or Nine Nights) is currently in full swing. 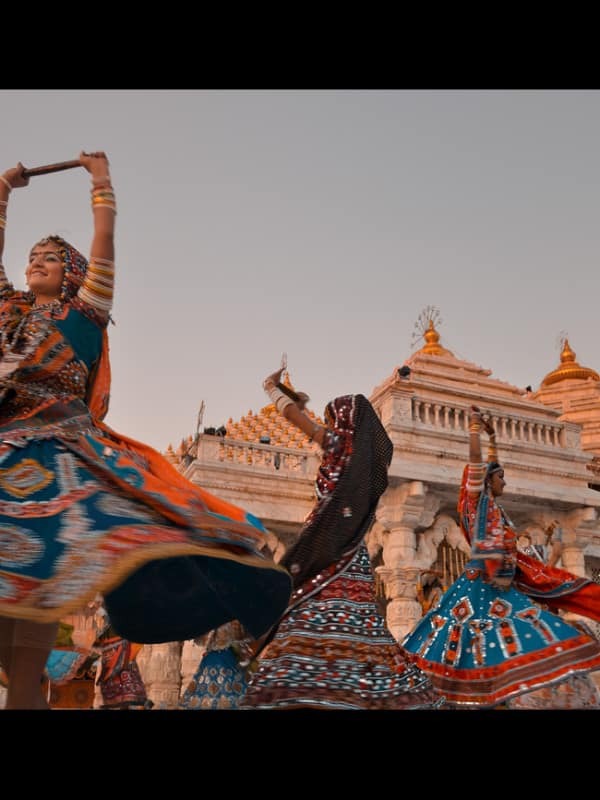 It’s a celebration of the mother goddess so it’s only fitting that it’s enjoyed with dancing in full color. Devotees young and old put on their most beautiful outfits and head to huge venues, both indoors and out, to display their best garba (dance) techniques. The most popular outfit (for women at least) is the gagra choli or chaniya choli. It consists of a choli, which is the beautiful bordered midriff top. The gagra or chaniya is a long and usually heavily embroidered or decorated skirt that flows ever so gracefully with the movement of the dancer. A dupatta is then carefully draped around the woman and sometimes over her head. Many men also dress up for Navratri, with many wearing beautifully decorated kurtas. Choosing the right outfit Navratri is a very careful task and is often planned a long time in advance. For each day of the event a different color is designated. In 2016 the Navratri colors in order are: Grey, orange, white, red, royal blue, yellow, green, peacock, and purple. 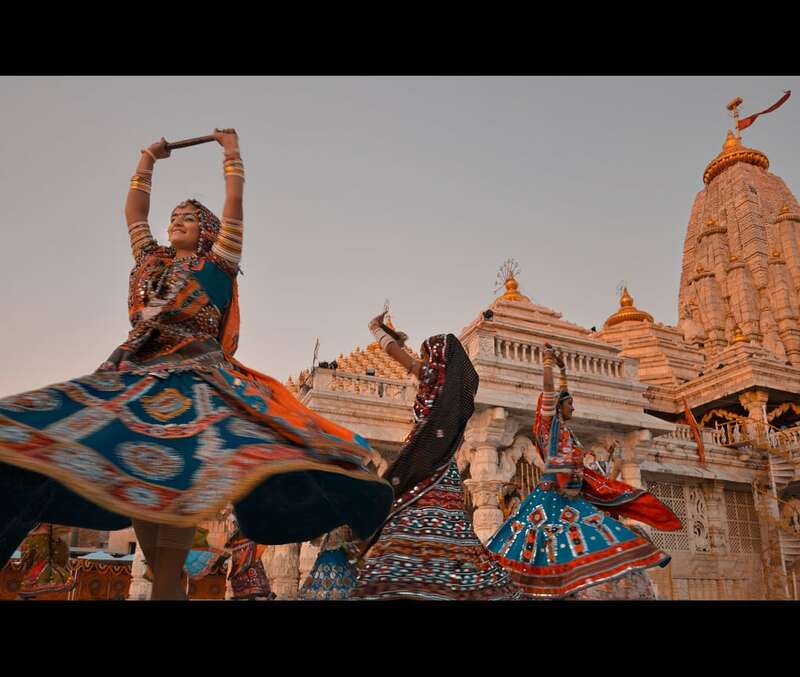 The most traditional form of Navratri dancing is the garba. This is usually done in a circle, with people clapping and spinning in tandem to the music. It is sometimes also done in large groups with pairs who use sticks called dandiyas rather than clapping. Without a doubt the best state to witness a Navratri garba is Gujarat. In every town and village you will find special Navratri events where people come together in their finest each night to dance and have fun. Some of the larger cities have huge events that can have thousands of attendees. If you’re in Vadodara visit the United Way Garba along with 30,000 other people and experience live music and of course plenty of dancing. The GMDC ground in Ahmedabad is one of the most popular in the capital city. If you’re in a smaller town, simply ask the locals or follow your ears to the music or look for local temples or public grounds, where some garbas are held. 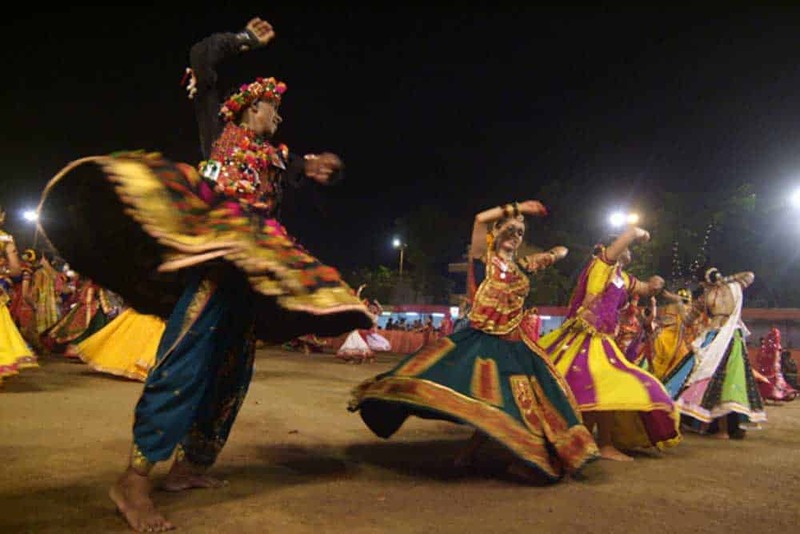 Mumbai is also a good place to enjoy Navratri thanks to its large Gujarati population. Much of the action can be found in the northern suburbs, including Goregaon Sports Ground which hosts up to 10,000 people each night. Further north at Pushpanjali Gardens Ground in Borivali West you can find Falguni Pathak. Falguni is nothing short of a living legend and the Queen of Dandiya. If you can get your hand on tickets to see her sing garba tunes you’re in for a real treat.